Mincemeat is a classic Christmas ingredient of dried fruit, candied peel, spice and brandy. It is traditionally enjoyed in pies made with shortcrust pastry. The pastry can be sweet or plain and is easy to make providing you follow a few basic rules. All butter pastry yields rich results but it is more difficult to handle. A mixture of half butter and half white fat makes the pastry easier to work and gives a short texture. The key to successful pastry is cool conditions and ingredients, and the dough should be handled as little as possible. Sieve the flour into a large mixing bowl. Add the fat and/or butter and lightly rub into the flour using your fingertips. As you do this, lift the mixture up out of the bowl to incorporate air - this will give you a lighter textured pastry. Continue until it resembles fine breadcrumbs. Check that there are no lumps of butter remaining by shaking the bowl - any lumps will come to the surface. Repeat until no more lumps appear. Sprinkle the cold water into the rubbed-in mixture, then mix with a round bladed knife until a dough starts to form. Draw the mixture together with your hands until it makes a rough ball. If the mixture is too dry and will not form a ball, only add a few drops of extra water. Take care not to make the dough sticky - it will be difficult to handle and produce tough pastry. Wrap the pastry in clingfilm and refrigerate for at least 30 minutes. Preheat the oven to 200°C, gas mark 6. Sprinkle a work surface lightly with flour and place the pastry in the centre. Take a lightly-floured rolling pin and roll out the pastry using short, sharp strokes. Give it a quarter turn and roll it again. Continue in this way until the pastry is about 3mm thick. Cut out 12 large pastry discs using the 8cm fluted cutter, then 12 small discs using the 6cm fluted cutter. Line the bun tin with the larger discs. Using a teaspoon, fill the lined tin with mincemeat. Dampen the edges of the small pastry discs on one side by brushing them with a little cold water. Gently press the small discs, damp side down, on top of the filled pastry bottoms and seal the edges. Whisk the milk into the egg yolk to make a glaze. 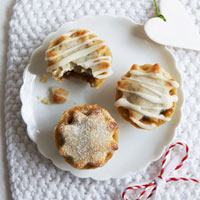 Brush this glaze on the top of each mince pie. Prick the lids with a fork to allow the steam to escape while cooking and prevent the pastry from going soggy. Place into a preheated oven for 10-15 minutes or until golden brown. Remove from the oven and allow to cool for 4-5 minutes in the tray. Remove and place on a wire rack. Serve warm sprinkled with caster sugar and leave to cool. Or dust with icing sugar and a pinch of cinnamon. The key to successful shortcrust pastry is to work quickly and to keep ingredients and utensils cool. Make sure you have everything prepared and, if you have hot hands, cool them down by running cold water over your wrists before rubbing in the fat. Cut the fat and butter into small cubes to incorporate quickly into the flour. Alternatively, instead of rubbing butter and fat into flour, chill until very hard and then grate using a coarse grater. Mix and then add the water. Resting the pastry by refrigerating for at least 30 minutes helps to reduce shrinkage during cooking. Shortcrust pastry can also be kept in the freezer for up to one month. Uncooked pies can be frozen. Make to stage 5, but do not glaze. Freeze in the tray, remove and then store in freezer bags until ready to use. To bake from frozen, return to the tray, brush with the glaze and place in a preheated oven at 200°C, gas mark 6 for 20-25 minutes or until golden brown. To make wholemeal pastry, simply replace the plain flour with wholemeal and add a little extra water, if necessary. For a lighter texture use half plain flour and half wholemeal. For an added nutty flavour, stir in 25g finely chopped nuts, such as pecans, walnuts, hazelnuts or almonds, into the rubbed-in pastry mixture. A citrus pastry will complement the mincemeat. Make by adding the finely grated zest of an orange or lemon to the rubbed-in mixture and use the juice instead of water to bind the pastry. Robertson Brandy and Hazelnut Mincemeat can be replaced with Robertson Rum and Raisin Mincemeat. Alternatively, add grated marzipan, extra brandy and cranberries to a traditional mincemeat to give it extra flavour.